When it comes to combining exercising and socialising with sightseeing and history, Melbourne has few better ways than the Bayside Trail. Winding around Port Phillip Bay for 18 flat and smooth kilometres between Williamstown and Brighton, this is a great route that can be walked or cycled. The Bayside Trail begins at the Williamstown Timeball on Battery Rd. You soon encounter the HMAS Castlemaine, followed by Scienceworks in Spotswood. The next landmark is the Westgate Bridge. Although it's forbidden to pedestrians and cyclists, you can cross the Yarra with the Westgate Punt, which runs on weekends and public holidays between 9am and 5pm, and which costs $5 (with no extra charge for bikes). Now on the eastern side of the river, you'll traverse the lovely Westgate Park, before passing through Port Melbourne, Albert Park and St Kilda, where you may want to browse the markets or have a coffee. Several kilometres on, you cross the finish line at Bay St, Brighton, a few hundred metres north of Brighton Beach. 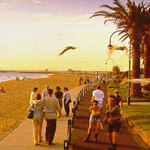 The great thing about the Bayside Trail is that there are plenty of parks, restaurants and cafes for you to relax in. So bring your friend, partner or family and make a day of it.